It’s springtime, you guys! I am so excited and, like most people, was so extremely tired of the cold and snow. Not that we get much snow in Alabama, but we had way more snow days this year than usual. 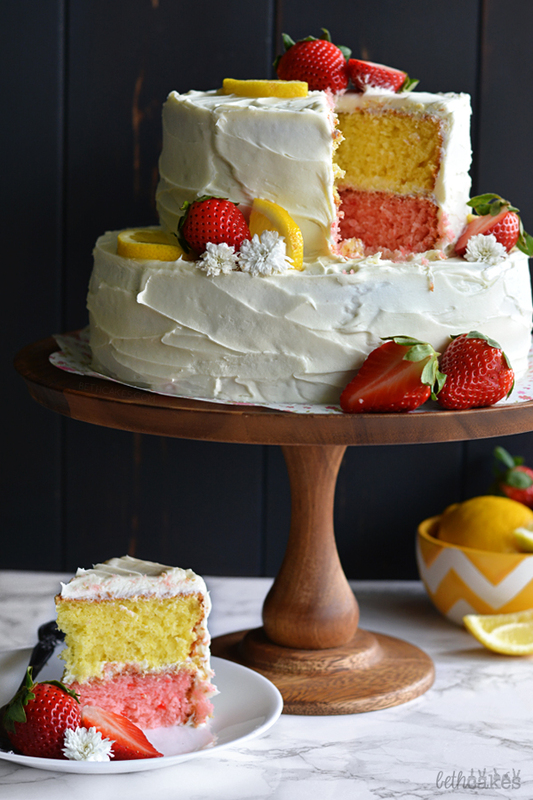 Last year I made a strawberry lemon cake for my family’s Easter lunch. 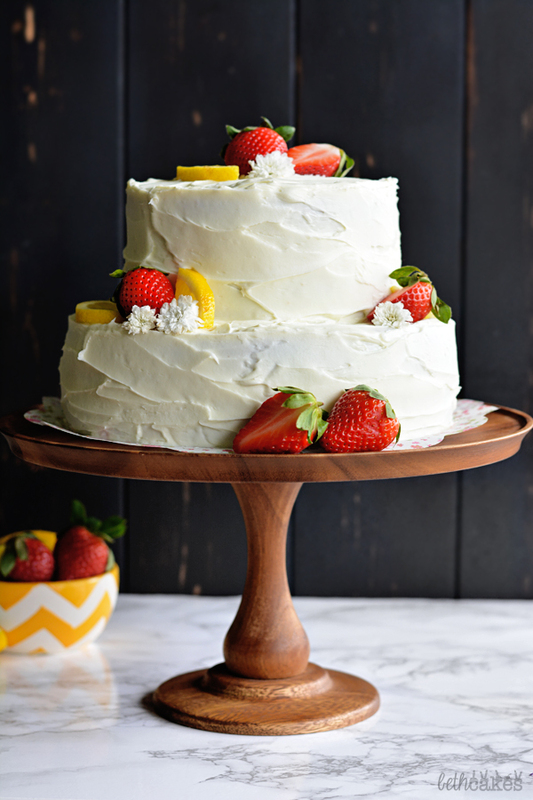 These flavors are probably the first that come to mind when I think of spring, so I decided to celebrate the warmer weather with a tiered cake! I’ve never made a tiered cake before, mostly just because I’ve never wanted to fool with adding supports and all that, but I didn’t do any of that with this cake. Just stacked ’em all up and slathered some frosting on there. On Saturday, my friends Meredith and Rachel came over and we had a photo shoot in my living room all afternoon. I honestly wish I could do that every single day! So we played with props and fabric and cooked bacon and played with edible flowers. Pretty good Saturday if you ask me! 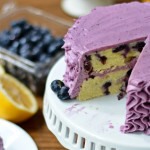 For the lemon cake layers, you can use this lemon cake recipe from my Blueberry Lemon Cake, minus the blueberries. 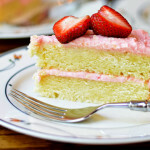 For the strawberry cake layers, I like this strawberry cake recipe from Southern Living. Except I cut the sugar from two cups to 1 1/2. 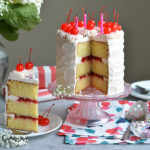 For the vanilla frosting, try this recipe from my Dark Chocolate Cherry Cake. You will probably need to double this recipe to cover both tiers. For the bottom tier of cake, I used 8 inch cake pans, and 6 inch pans for the top tier. Bake the cakes for 18-20 minutes. My 6 inch layers were a little thicker than the bigger ones, so they still baked in about the same time. You did a great job! I love the simplistic outside with the pops of color inside too. Thanks, Ashley! I’m totally in the springtime zone right now. Can’t stop! What a beautiful cake! Strawberry lemon is my favorite spring combination! Absolutely beautiful cake, Beth! 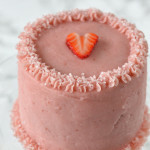 I go crazy over anything strawberry so I love this cake! WOW. What a cake! 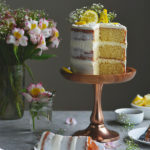 I love the tiered layers and your beautiful decoration of it… so perfectly springy- and ideal for easter too. This cake is absolutely stunning and I’m sure delicious! This looks so pretty! I never thought of mixing flavours in a cake! Beth your photography gets better and better with each post! I love it and I cant wait to make this cake! This screams spring to me! Beautiful! This cake is beautiful! 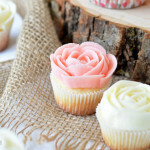 I love the idea of different flavored layers.